The peptides sector of the biotechnology industry has ridden out the global economic challenges of recent years largely on the strength of existing and advancing peptide projects in pharma pipelines and continuing demand for peptides in a range of research applications. Companies are expressing optimism that the increase in requests for proposals (RFPs) they began to see toward the end of 2012 will continue and return the sector to the double-digit, 10–12% growth rates it enjoyed 4–5 years ago. “2012 was the best year we have had in terms of getting peptides approved,” says Rodney Lax, senior director of business development at PolyPeptide Group. Can that be interpreted to mean that peptide developers and manufacturers have reached a certain comfort level with the regulatory process? Not exactly. “However, I think we are coming to terms with what the FDA wants,” says Lax. Essentially, the industry is having to grapple with small molecule specifications for impurities in peptides, which can be up to 40–50 amino acids long. “These are not small molecules, they are more like small proteins,” Lax adds. The past year saw the approval of therapeutic peptides targeting a range of disorders. In the U.S. these included Linzess (linaclotide, Ironwood Pharmaceuticals) for the treatment of chronic constipation and irritable bowel syndrome with constipation in adults; Surfaxin (lucinactant, Discovery Labs), a pulmonary surfactant for intratracheal use; Omontys® (peginesatide, Affymax/Takeda) to treat anemia due to chronic kidney disease in adults on dialysis; Kyprolis™ (carfilzomib, Onyx Pharmaceuticals) a proteasome inhibitor to treat multiple myeloma; Gattex (teduglutide, NPS Pharmaceuticals) to treat adults with short bowel syndrome; and Bydureon (an extended-release version of Byetta, with the active ingredient exenatide, Amylin/Alkermes) for patients with type 2 diabetes. The Novartis drug Signifor® (pasireotide) for the treatment of Cushing’s disease received approval in the EU in 2012, and FDA approval in the U.S. is expected in 2013. We estimate the current peptide drug market, for the final product, at $15 billion, says Mimoun Ayoub, vp of global business, sales and strategic development at Peptisyntha, a Solvay company. More than 85% of those sales derive from synthetic (vs. recombinant) peptides. The value of the peptide API market is an estimated $950 million, according to Ayoub. “About 50% of this value is merchant, and the remaining is captive (made by the pharma and biotech in-house),” he adds. 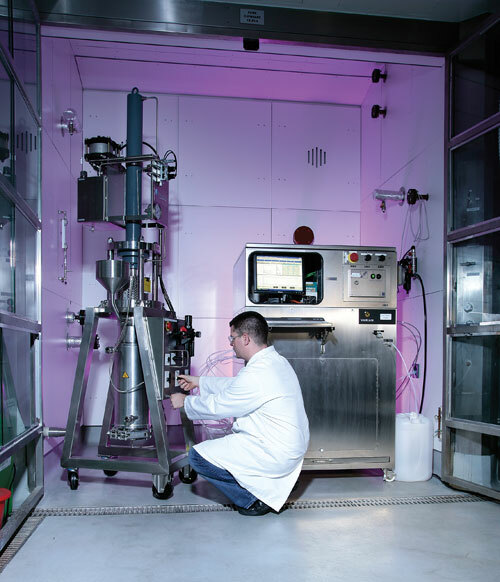 Over the past two years, Peptisyntha expanded the manufacturing capacity at its Brussels facility, adding large-scale solid-phase synthesis capability to the existing solution-phase synthesis technology in place there. Clear trends in product and technology development include greater demand for longer and more complex peptides, advances in peptide delivery systems, and an overall increase in scale of production as peptide drug candidates advance into and through clinical development and onto the market. Peptides are also finding novel applications in medicine and in other fields including food sciences, cosmeceuticals, materials science, and nanotechnology. “The quantities needed are going up quite dramatically,” says José de Chastonay, CMO at Bachem. Whereas many peptide drugs are injectables, advances in oral peptide drug delivery and in other delivery approaches such as transdermal, nasal, and depot formulations may necessitate larger doses. With some formulations, reduced bioavailability compared to injectables can require much greater quantities of API, whereas some of the emerging conjugation and modification strategies that protect the peptide from degradation or help deliver the drug to its target site of action and increase its selectivity can drive down therapeutic dosing needs. As growth in the GMP peptides business continues, “customers are asking how we would implement increasing scales of manufacture,” says Alastair Hay, Ph.D., senior group leader at Almac. “The complexity of the design of peptide products is increasing,” whether due to the peptide’s longer length, or some sort of unnatural modification or linkage to another molecule to improve biological function or selectivity. This may require adapting the chemistry used in synthesizing the peptides, Dr. Hay notes. He remarks on the continuous advances in peptide synthesis and downstream processing technology over the past several years, including new resins and purification media. While it is important to keep abreast of these developments and to assess their value, it is critical to do so in the context of a particular process and application. “You need to understand whether a new development is an improvement for your process,” says Dr. Hay. “You do not want to make a change if, on the whole, it will not give you a benefit.” Additionally, something that is advantageous on a small scale might not be beneficial economically on a larger scale. Even as the resins used in peptide synthesis are becoming more sophisticated, “research is still needed to determine what features are relevant for consistent high yield bearing,” says de Chastonay. Improvements in analytical methodology are enabling manufacturers to measure more impurities and with greater accuracy, which becomes increasingly important with the production of longer peptides. Yet new types of molecular species, unnatural modifications, and analytical techniques often mean breaking new ground from a regulatory perspective, and there is not always clear regulatory guidance to cover every circumstance, often requiring manufacturers to use their judgment. “Scale does not present any particular challenges at present from a synthesis perspective,” says Lax. “Few peptides are being manufactured at a scale above 100 kilograms/year; many more are being produced within the 30–50 kilogram range, and that number is increasing. “You can make 100s of kilograms cost efficiently using solid-phase peptide synthesis technology, but you need large-scale reactors and the capability to do large-scale cleavage and purification, all the way through spray drying, or more typically lyophilization,” says de Chastonay. And you need all of the infrastructure to go along with such a large-scale manufacturing operation, including, for example, solvent delivery, solvent handling, and waste-stream handling. At the same time, notes de Chastonay, companies are under pressure to meet increasingly strict emission and waste disposal standards. With the large columns available “we routinely make batches of many kilograms,” says de Chastonay. But there are important considerations, such as having that much money invested in a single batch of product. “And you have to consider issues related to scale-up, such as how long it takes to purify; will you get degradation?” Similarly, for large batches, is it important to invest in lyophilization equipment that is sized properly? As peptide drugs are progressing through clinical development and successfully achieving commercialization, and both scale of production and a reliable supply chain become critical concerns, companies are increasingly seeking back-up manufacturers for their products. Lax describes this as “logical development” as the GMP peptide market matures. For peptide producers, it provides an additional revenue source, in addition to generic peptides and proprietary projects developed in-house. Peptisyntha initiated two programs about five years ago aimed at expanding the company’s peptide technology beyond its API business and the classical CMO model, and to apply its manufacturing expertise to develop products and techniques to aid in cell culture and drug delivery. The first program involves the design of self-assembling peptide sequences that can be conjugated with other features to form hydrogels. These have applications in cell culture and tissue engineering, and Peptisyntha is beginning to amass data on the capabilities of these hydrogels. Ayoub reports that a few cell lines have successfully been grown on these hydrogels with no toxicity exhibited by the biomaterials. The second program utilizes this same hydrogel concept, but modified for use in controlled-release drug delivery. In the research arena, demand for peptides is increasing in a variety of industries, notes de Chastonay. The foods industry is exploring the potential of peptides for increasing the shelf-life of foods. In cosmetics, peptides are being added to high-end products designed to remove wrinkles or lighten dark spots on aging skin. The semiconductor industry is experimenting with the properties of peptides that enable them to channel electricity, for example. And as the field of nanotechnology grows, peptides are one of many classes of molecules being studied across a range of applications. While this history and recognition assists in the regulatory process, “the validation of the analytical methods, the systems, and processes are cumbersome and have not become less so over time. It is important to evolve with the times,” de Chastonay adds. When the ICH guidelines for process validation changed in January 2011, “it put a lot of pressure on CMOs and sponsors to take a more quality-by-design approach to doing validation and optimization of manufacturing processes,” recalls Lax.